Earth pays its annual visit to the Leonid meteor shower Thursday night and Friday morning; this view is at 1 a.m. looking east. As the Earth moves around the sun in its annual orbit, it passes through patches of space debris left behind by comets and asteroids. As it moves through these clouds of dust and sand-sized particles, it sweeps them up, and they are heated to incandescence by friction with the Earth's atmosphere, causing bright streaks of light in the night sky known to scientists as meteors, and to skygazers as shooting stars. Meteors can be seen every night; these are known as sporadic meteors. But when the Earth passes through a cloud of debris, it sometimes produces displays known as meteor showers. 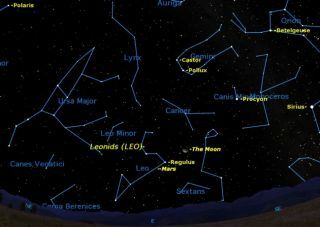 A famous annual shower known as the Leonids is set to peak Thursday night (Nov. 17). Unlike rain showers, meteor showers are not concentrated. Usually they mean seeing 10 or 20 meteors an hour, as opposed to the typical average of one or two. Most of the time the Leonids are a fairly quiet shower, but every 33 years they put on a major display, known as a meteor storm. This last happened in 1999, when more than a thousand meteors per hour were observed. We're not expecting a major display this year, but it's always worth watching in case we hit a lucky break. This year we have to contend with a bright third quarter moon, whose light will obscure some of the meteors. We also have bad timing. The peak of the shower is predicted to occur this year Thursday night around 10 p.m. EST, when the radiant, the point in the sky from which the meteors appear to originate, is below the horizon. The meteors probably won't start to appear across eastern North America until after midnight, though we may catch an occasional Earth-grazer earlier than that. By 1 a.m., which the graphic above depicts, we will have a pretty sight facing east. The planet Mars, the first magnitude star Regulus, and the third quarter moon will be at stage center. The star Capella will be almost overhead with Castor and Pollux below it. The constellations Orion and Canis Major will be off to the right, with bright stars Betelgeuse, Rigel, Sirius, and Procyon. The constellation Ursa Major, containing the Big Dipper, will be to the left. The actual point from which the meteors appear to stream is just above Mars. Oddly enough, this is not the best direction to watch for meteors. Meteors can appear anywhere in the sky, and are brightest with longest trails about halfway across the sky from the radiant. Find a location far away from city lights, and go out after midnight. Dress warmly and lie back comfortably on a deck chair. Look high in the sky, either to the north or south. Give your eyes sufficient time, 15 or 20 minutes, to get adapted to the dark. Avoid looking directly at the moon, as that will ruin your dark adaptation. And then, be patient. You may watch for as long as half an hour without seeing a single meteor. And then suddenly you may see two or three in a row. Then, continue to be patient. This is not a fireworks display, though meteor showers are sometimes advertised as such. Most meteors are faint and fast moving. Meteor showers are subtle things, most of the time not spectacular, but immensely rewarding. The meteors you see are all one-time events, each and every one. They are the final markers of comet Tempel-Tuttle, first seen 645 years ago in the year 1366. By all means try to photograph these meteors. All that's needed is a dark sky and a solidly mounted camera capable of time exposures. Exposures of 5 or 10 minutes will be best. The stars will be curved trails because of the Earth's rotation; the meteors will be straight lines radiating from Leo. Try to point your camera so that the moon is blocked by a foreground object, to avoid overexposure. Editor's note: If you snap a stunning view of the Leonid meteor shower and would like to share it with SPACE.com, send images and comments on the view to managing editor Tariq Malik at: tmalik@space.com.